Below is the response from the Intumescent Fire Seals Association (IFSA) to the Ministry for Housing, Communities and Local Government consultation on amendments to statutory guidance on assessments in lieu of tests. The Intumescent Fire Seals Association would like to offer its deepest condolences to the victims, their families and all those in the community affected by the Grenfell Tower fire tragedy in London. Incidents of this kind are thankfully rare but they are a shocking reminder of why the Association and its member companies must continue to strive towards improvements in fire safety products and standards. The Intumescent Fire Seals Association held its 35th Annual General Meeting in February, hosted by member company LKAB Minerals, Derby. 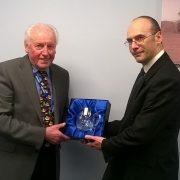 During the proceedings the association chose to mark the occasion of the retirement of long serving consultant, Paul Baxter. Paul has supported the association for over thirty years, using his considerable expertise (and undoubted passion) in penetration sealing systems to promote the interests of the passive fire protection industry in the UK and Europe. He served on several standards committees, including the chairmanship of FSH 22/-/3, which is concerned with test procedures for penetration fire seals. Paul has been a perennial and tireless campaigner for effective penetration fire sealing systems and his retirement in 2016, though well deserved, was nonetheless a significant loss to the association. The Intumescent Fire Seals Association wishes Paul Baxter a long, healthy and happy retirement. The Intumescent Fire Seals Association [IFSA] strongly supports the Fire Door Safety Week initiative. As most people will know, the intumescent seal that is visible around the perimeter of a fire door assembly plays a crucial role in maintaining the performance of the assembly under fire exposure. Many other intumescent products will be present in the construction, however, and while they may not be so obvious, they all contribute in some way to the overall performance of the assembly and the safety of building occupants. • Intumescent glazing seals around vision panels and a further hidden lining around the aperture, sandwiched between the glazing beads and the door core. • Air transfer grilles with an intumescent lattice matrix sandwiched between. • Intumescent liners within letter plate apertures. • Intumescent protective pads under the hinge leaves that would otherwise conduct excessive heat into the surrounding timber components, leading to premature degradation and breakdown. • Intumescent protective cladding around other hardware items such as locks, latches, keeps, shoot-bolts, security viewers, etc. • Intumescent sealant between the door frame and the wall construction. Today’s fire door assemblies are highly dependent on intumescent technology and it is true to say that without the vital contributions from the intumescent elements, the fire integrity of the door assembly would be catastrophically compromised. Further details are freely available from IFSA in the form of downloadable information sheets. There has been a growth in the use of composite doors (GRP faced mineral/foam core doors), typically as entrance doors for flats, with a corresponding increase in use of insulated glass units (IGU’s) within them. Door assemblies based on plastics and foams require a completely different approach to the more traditional timber or steel based constructions. There have been developments in glazing systems for these types of units within composite doors, which must be strictly followed if the IGU is to provide required level of fire resistance. Fire rated composite doors is a rapidly growing industry and there is a significant level of malpractice at the installation stage arising from a lack of understanding or appreciation of the glazing system. Fire resistant glass is a vital part of building design and there are two basic types, insulated and uninsulated. The insulated glass has more than one glass layer interleaved with another material which provides insulation to the required level by increasing the number of layers. Uninsulated glass was traditionally made fire resistant by the use of embedded wires forming a grid. This is very effective but has the disadvantage that the wires are visible. Later it was found that clear modified toughened glass was able to withstand the fire resistance test but only toughened borosilicate glass was sufficiently reliable since it benefitted from low thermal expansion compared with soda lime glass. Insufficiently toughened soda lime glass can fail quite quickly in a fire test, around 6 to 10 minutes being commonplace. However, recently there have been significant developments in toughened soda lime glass and a number of glass manufacturers are now able to produce reliable fire-rated toughened glass products. These newer, more reliable modified toughened glass types still require appropriate intumescent seals around the perimeter in order to consistently work. Edge cover and temperature difference across the face of the glass is still critical to performance, as is protection to the beads from the heat of the glass and ensuring the pocket around the glass is adequately protected when the glass begins to expand and move. Intumescent seals help to accommodate the distortion of the soda lime glass and the consequent movement of the beads. Some intumescent glazing tapes are better than others in this respect so it is important to use the product that has been proven to work for the particular glass in question. Interchangeability of the intumescent glazing tape is not usually possible in fire glazing applications when using modified toughened soda lime glass. There has been an increase in the use and specification of higher performance doorsets, which has required the development of innovative glazing systems that can accommodate different design features, bead materials, aperture sizes, as well as cope with other types of glass (other than ceramic which is the normal ‘go to’ glass at this level of performance). These types of glazing systems are highly specialist and must be installed correctly to cope with the extreme demands of 90 and 120 minute tests. The Intumescent Fire Seals Association (IFSA) is aware that doubts have been cast on the fire performance to be expected from Beech hardwood when incorporated in 60 minute fire door assemblies, in the form of frames, lippings or glazing beads. It is the experience of IFSA members that there is variability in timber, door leaf manufacture, workmanship and installation practices that can affect the performance of most door assemblies, regardless of the species of hardwoods incorporated. Intumescent seals have been proven to make a positive impact upon the performance of timber based constructions, including door assemblies, and IFSA is furthermore aware that Beech frames, lippings and glazing beads have been included in some 60 minute door assemblies, with positive results, using member companies’ intumescent systems. IFSA does not support proposed rules restricting the use of particular timbers, as this does not take into account the interaction of materials that are present within door assemblies, not least the proven benefit of intumescent materials. Future innovation would furthermore be stifled. Throughout the industry, the fire resistance of products is determined solely by evaluation of their performance against agreed testing procedures, and this is an approach that is fully embraced by IFSA. The Harmonised European Product Standard for fire resisting doorsets (EN 16034) was published in October 2014, completing the group of EN documents which relate to the CE marking of fire resisting doorsets within the scope of the Construction Products Regulations that apply to all member states of the EU. The CE Marking of all construction products is mandatory under European Regulation 305/2011 (Construction Product Regulation) for all products for which there is a harmonised product standard. The Official Journal of the European Union (OJEU) C378 Volume 6, dated 13 November 2015, includes the citation of EN 16034 and states that it will be a harmonised standard from 1 September 2016. The citation of EN 16034 also states that the coexistence period, where CE Marking of doorsets is voluntary, ends on 1 September 2019. CE marking of fire resisting doorsets will thus become mandatory during the current validity period of this report. Under EN 16034 only configurations defined as ‘doorsets’ are able to be CE Marked. The definition and requirements of doorsets as defined for the purpose of CE Marking is complex and the Notified Certification Body (NCB) should be consulted regarding your particular situation. A NCB can start the process of attesting conformity of doorsets now and this is advised given the likely pressure on testing facilities.